A brief story about Jeff the front man @ Kupu-kupu Garden Guest House & Cafe. He was born in Medan. Moved to Jakarta at 8 years old. Regularly holidayed in North Sumatra during his childhood. Went to Bali in the 1970s and enjoyed the beach life working with travellers, learning to speak English. He was then offered a job in Balikpapan, East Kalimantan teaching Indonesian to ex-pat oil field employees. Jeff then became a radio operator for UNOCAL76. While on holidays in Bali he had the opportunity to go to Australia and proceeded to live in Sydney, Canberra and Melbourne for over 30 years. Jeff travelled to Indonesia and other Asian countries regularly. He decided to move back to North Sumatra in 2009 and started the building of Kupu-kupu Garden Guest House & Cafe in Bukit Lawang. Jeff has since been working with local Bukit Lawang people to create and operate small boutique eco-friendly guest house business. He provides jungle adventures to travellers/tourists from all over the world. Jeff has created a unique place and can provide you with a unique experience. A true jungle adventure, a memory forever! 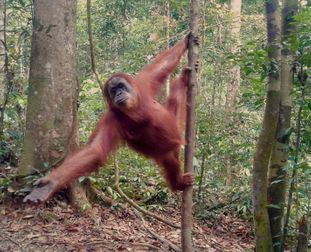 He can assist you to organise transport, orangutan treks into the jungle and tours to surrounding areas in North Sumatra. Jeff works with local Bukit Lawang people to provide for you a cultural & adventurous jungle experience. He can assist you to organise a personalised travel itinery whilst in Bukit Lawang and the surrounding areas in North Sumatra. At Kupu-Kupu Garden Guest House & Cafe, Jeff and his team of local workers are focused on providing tourism services with the highest levels of customer satisfaction. ***Your feedback is important to us ... If you do stay at Kupu-kupu Garden Guest House & Cafe in Bukit Lawang, it would be great if you could write a review on the Trip Advisor website to provide your feedback for us and other travellers. Kupu-kupu Garden Guest House & Cafe just outside Bukit Lawang village is a boutique, rustic, small eco-friendly tourism business. Set in a tranquil location surrounded by the lush tropical rainforest on the edge of a fresh, clean, flowing river, opposite 1,000,000 hectares of UNESCO world heritage listed National Park. Bukit Lawang accommodation, tours and transport.